One Thing Leads to Another | Does This Font Make Me Look Fat? You know how this goes. You want to get a project finished, but before you can really start there are other things that have to be done. The project: fill the window boxes in the front of the house. Last Thursday the Green Thumb Garden group of the St. Michaels Woman’s Club took a bus trip to London Town in Edgewater, MD. We had the first day with no rain in 20 days. 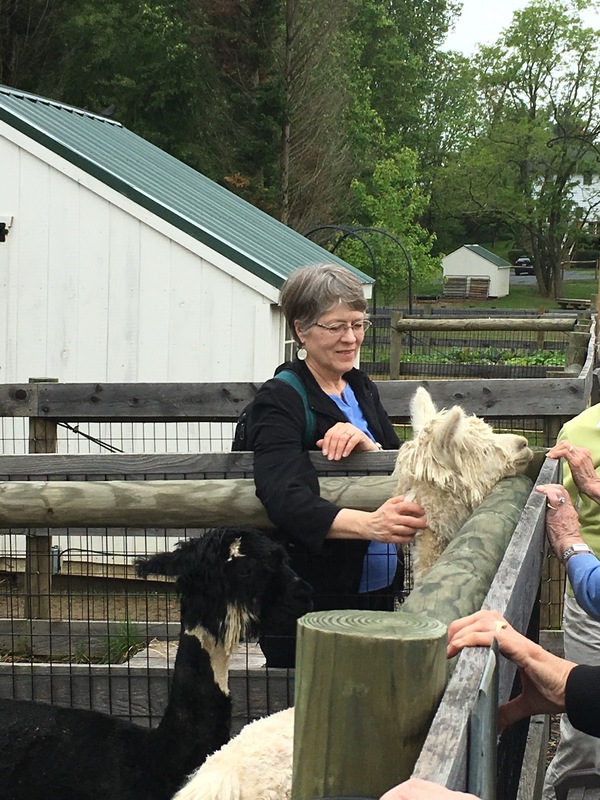 After touring Londontown and its beautiful, soggy gardens we boarded the bus to Homestead Gardens in Davidsonville, MD. We were there to shop! The bus had loads of room underneath and Homestead Gardens has a fabulous selection of plants for my window boxes. Oh, and llamas and alpacas. I wanted to find a replacement Golden Showers rose. It’s a pillar rose and the one I have is ten years old and showing its age. Three years ago I ordered another one from Wayside Gardens to put in as a replacement. It has not done well. And the three Fairy roses I ordered from Wayside the same year have never bloomed! I am not ordering plants from Wayside again anytime soon. Homestead was very low on climbing roses and did not stock Golden Showers. I bought a pink climber to try. I also was in the market for annuals to fill the window boxes on the front of the house. 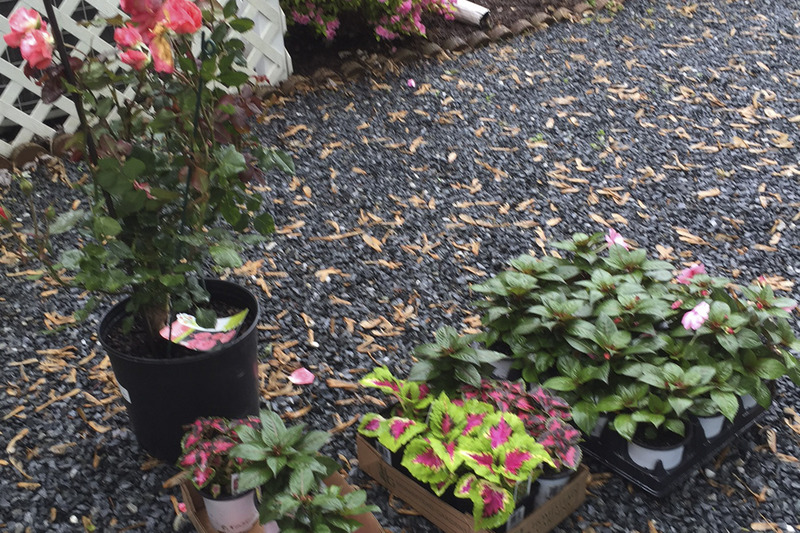 Homestead had Sunpatiens – a new cultivar of New Guinea impatiens that does well in the sun. So I bought 15 which is what I need for the five window boxes. I fill in with some other things – so I bought more plants. Before I began on the window boxes I needed to plant that rose. I started to dig a hole but the ground was so wet that I abandoned that and will try again when things have dried out. See all those maple tree helicopters. That’s another project with the blower, but requires the fliers to be dry. Now I had the plants, but before I could plant the window boxes I had to make sure the drip irrigation system was working. That required a trip to the store for new 9V batteries. I have two drip irrigation systems. One for the window boxes and one for the raised veggie beds. The systems have timers which need to be set for day, time of irrigation and number of minutes. But before you can do that you have to set the time and day you are setting up the system. All this is done using five little buttons. Something has to be blinking before you can program it. Since I do this once a year I never can remember the sequence. Even with the instructions it’s daunting. 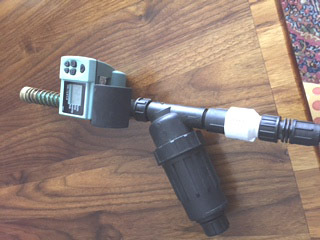 However this year I resolved to program the darn things before I put them on the hose. Every year in the past I’ve installed them and then ended up lying on my back trying to figure it out. Result: lots of cursing and plants getting watered at strange times. So now the gizmo is programed and ready to be attached to the hose. It’s really windy today, so I’ll wait until tomorrow. Then I need to turn it on and see if there are any leaks in the system. Then I can plant my window boxes. The weather forecast is for cold night temps tonight. I don’t want to put the boxes out and have them blasted. Tomorrow might be a good day. Those window boxes will be in by the end of May. I still have to program the system for the raised veggie beds and test it. I know there is a major leak in one of the big hoses. Damn squirrels chewed it last fall. But, of course, I didn’t put a piece of tape around it so have to turn on the system and be prepared to get wet while I hunt for the leak. Like I said, one thing leads to another. But I am going to get the system set up before I attach it to the hose outlet. I do occasionally learn to work smarter. Note: The bunnies have found my raised veggie beds. The BB gun is coming out of the closet. This entry was posted in Friends, Gardening, Landscaping, Personal, Raised garden beds, Uncategorized and tagged climbing roses, drip irrigation, Homestead Gardens, London Town, raised beds, Wayside Gardens by Mala Burt. Bookmark the permalink.